Wikipedia reported that on December 21, 2012, “Gangnam Style” became the first YouTube video to reach one billion views. 1 As of May 31, 2014, the music video has been viewed over two billion times on YouTube, and it is the site’s most watched video surpassing Justin Bieber’s single “Baby.”2 While South Koreans have celebrated Psy’s exceptional cultural success in great joy, Joseph Cheah and Grace Ji-Sun Kim examine Psy’s “Gangnam Style” phenomenon theologically in their publication, Theological Reflections on “Gangnam Style”: A Racial, Sexual, and Cultural Critique. The main purpose of this book is to theologically reflect on Psy’s “Gangnam Style” in light of Jung Young Lee’s theological notion of marginality found in his Marginality: The Key to Multicultural Theology. Before their theological reflective work on Psy’s “Gangnam Style” using Lee’s marginality theory, they thoroughly analyze Psy’s music video from a historical, racial, and cultural perspective. In Chapter one, the authors investigate historical Asian American masculine and feminine stereotypical images appearing in the North American media and entertainment industry. In their opinion, a key reason for Psy’s success is that his male image “fits into [an] Asian male stereotype of a jester, offering goofy laughs for all”(8). They realize it is an Asian American’s negative male image, often laughed at. In Chapter two, the authors inquire into the reasons for Psy’s surprising hit, not just in South Korea and North America, but across the world. According to their insights, Psy’s music video depicts Psy’s ironic critique of Gangnam people’s life style. In the video, the song’s rhythm, melody, and visual discourse imply that the life style of Gangnam residents, who represent centralism, authority, power, the epicenter of their sociocultural context, have become “hollow or false” (41). It indeed evokes people’s positive response. Also, they assert that Psy’s stress on Koreans’ own sociocultural context, native language, and sensibilities, generates his global popularity by breaking common prejudices (69). 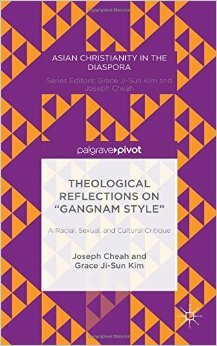 In Chapter three, the main chapter, the authors theologically explore Psy’s “Gangnam Style” in light of Lee’s theological concept of marginalization. They identify that Psy’s music video is a compelling, lived example of Lee’s theology of marginalization which challenges normative Western hegemonic centralism. The phenomenon is an example of “marginal centrality” that does not intend to move to or join the center of the dominant West, but stays at the margins itself as (a new) center (5). In other words, Psy’s creativity arises at the margins by dismantling the Western center. In this respect, marginal centrality enables a new meaning for life by emerging as a displacing center and which eventually pursues multiple centers through a multiplicity of marginalized people in various situations (73). In the concluding chapter, in my view, the authors hope that eventually North America will not laugh at (any marginalized) one but with one by respecting the dignity of others who have different cultural backgrounds. This creative volume is the result of interrogative and integrative discourses with public theology, historical studies of Asian American sexuality, cultural studies, contextual theology and Asian theology. A notable strength of the book is that they reaffirm the reliability of Lee’s theology of marginalization which affirms the margins’ transformative and creative potentials. These are reflected in Psy’s “Gangnam Style.” Moreover, the authors’ insight on the difference between “laughing at Psy” and “laughing with Psy” in the concluding chapter helps Asian Americans realize that now is a poignant time to think over sexual stereotypes of Asian Americans in the racialized U.S. society. This book is a good resource book for theologians and teachers of culture who are at the racial margins and want to perform their own innovative work in racial relations, conflict, and prejudice in the pop-cultural realm. I, myself as a theologian of a racial minority, now can truly congratulate this “unknown” Asian male singer’s surprising success in America and the world, thanks to this book’s healthy theological critique and insights.